There's been a good amount of buzz about how social media technologies such as Twitter and Facebook are paving the way for business collaboration. 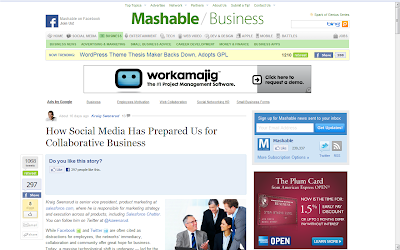 Take this recent story on Mashable by Kraig Swensrud. He writes about how the benefits of social media can be brought inside the firewall, allowing us to communicate and collaborate in real time. I agree with Kraig when he says, "With new enterprise social tools, we can harness the power of real-time social networking to rebuild the workplace and create a collaborative forum where we can be inspired by real-time engagement, real-time innovation, and the strengthening of our workplace communities." I'll add, however, that this does not mean we can just literally use Twitter and Facebook at work. I submitted my thoughts in the comments, so flip over Kraig's article and scroll down to my feedback to catch them. UPDATE: A good follow-up story to read is this Forbes article by Bruno Aziza. He writes, "As it turns out, social media has the potential to resolve issues other than collaboration or communication. It has helped many solve what has plagued boardrooms for decades, a problem that just 1 company in 10 can effectively solve: strategy execution." Bruno goes on to explain how poor execution of social media strategies within an organization often leads to communication and engagement failures between employees. The question then, is, who should be responsible for driving social media strategy inside an organization? What do you think? Give his argument a read, and feel free to leave your feedback here, or on his article.